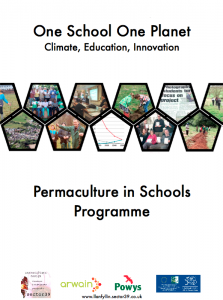 We are pleased to release our ‘One School One Planet’ ‘Permaculture in Schools Programme’ proposal. We are developing a twelve unit scheme of work based on the twelve principles of permaculture, which will be delivered through a wide range of academic subjects – from Mathematics, Photography and Geography, to English, Welsh, Religious Studies and everything in between. Indeed, there is hardly a subject that doesn’t intersect with our climate crisis in one way or another. We are hoping to start implementing the programme over the coming months. Keep your eyes peeled for developments!